Fluffy, Filling but not heavy and DELISH! If you follow my Instagram stories, you know my son LOVES breakfast! On weekdays, he usually eats eggs with toast and fruit, on Saturdays he loves to make a bacon and egg sandwich and on Sundays we make Pancakes! 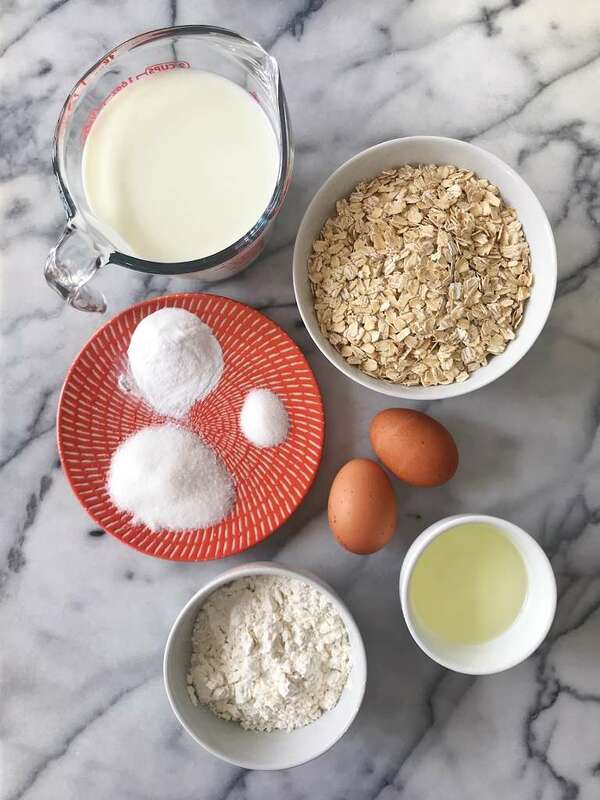 We used to make pancakes only with a mix (nothing wrong with a mix — we still use one some mornings!) but at the recommendation of a friend we branched out a year ago and tried a made-from-scratch pancake recipe…It was a total hit! 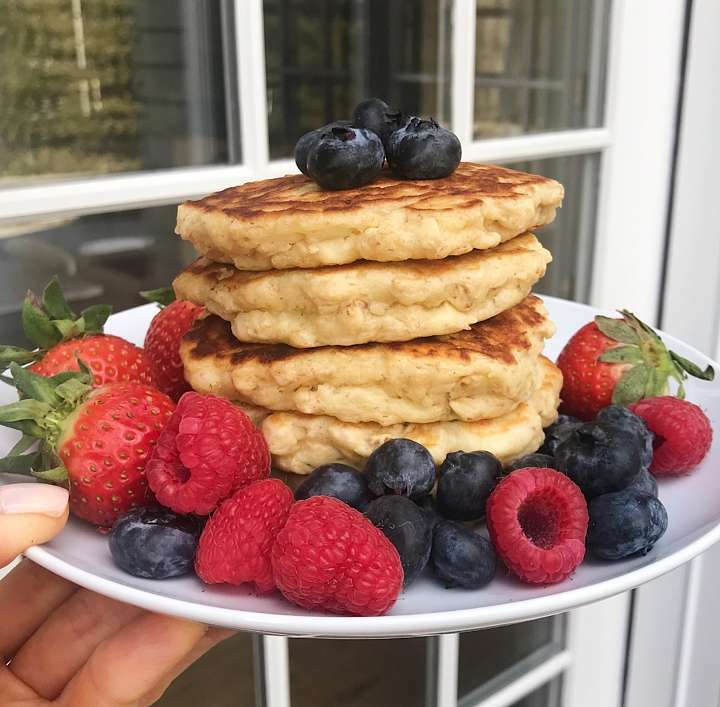 We have been eating these Fluffy Oatmeal Pancakes ever since! They are filling without being heavy and delish! 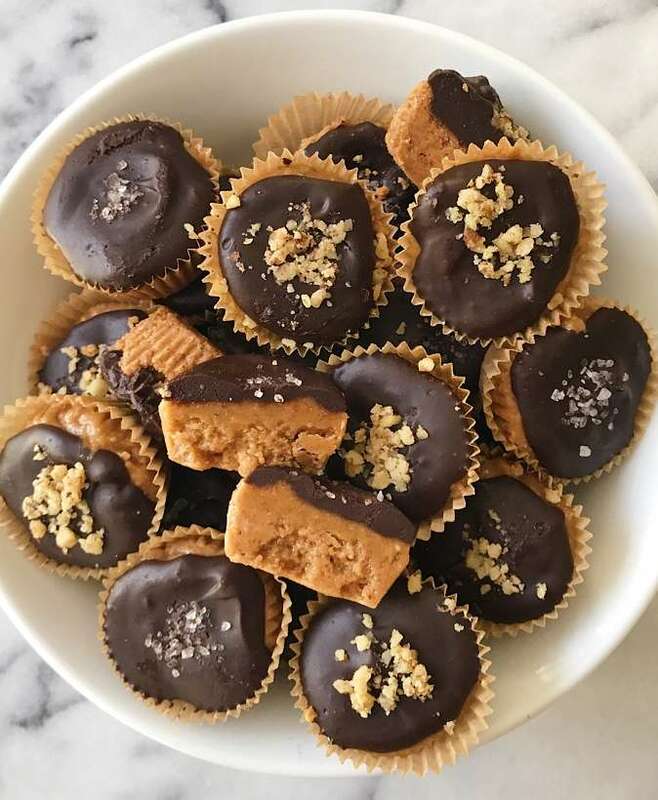 They are made with only 8 real, whole food ingredients: milk, gluten-free rolled oats, eggs, oil, gluten-free flour, sugar, baking powder and salt. 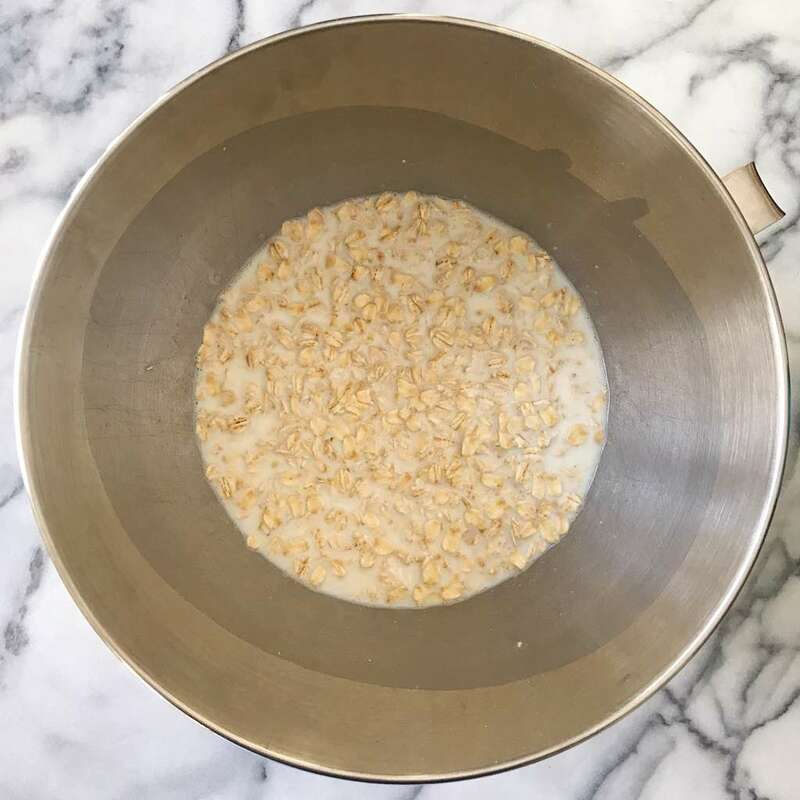 The key to making this recipe is soaking the oats for 10-15 minutes (if you’ve made these before, I recently increased the soaking time because I realized I was soaking them longer by virtue of starting the process, then getting distracted in my kitchen! 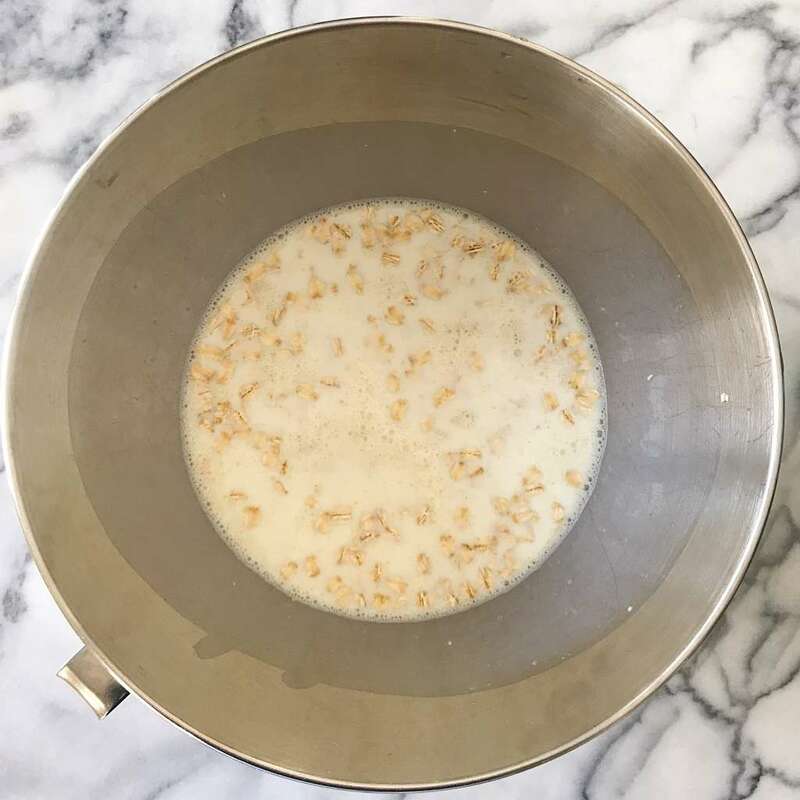 So before you even get all your other ingredients ready, pour 2 heaping cups of gluten-free rolled oats into a bowl, pour 2 cups of milk over them, stir to combine and let sit. This is what they look like after soaking for 15 minutes. Next up, you add in the eggs, then the oil, then the rest of the ingredients. This is what the batter looks like when all mixed up… it’s pretty thick and I usually use a spoon to scoop onto the skillet. Recipe adapted from Genius Kitchen, the batter is super easy to make and makes a large quantity. 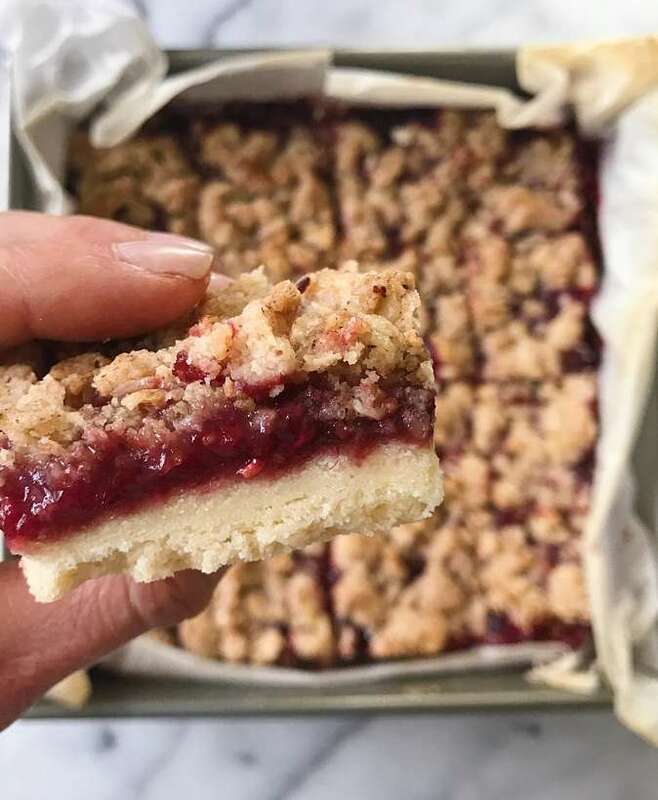 You could cut the recipe in half but we like to make the full recipe and save half the batter in the refrigerator for the next day. Nothing better than cooking once, eating twice! Bonus: you may have extra batter for tomorrow! 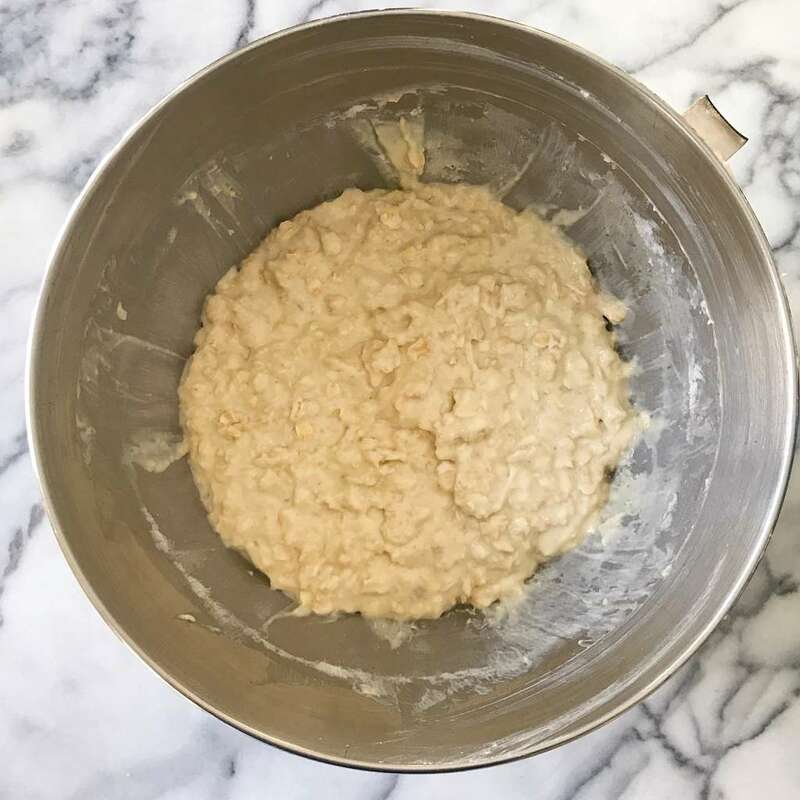 A note about Oats: Oats are naturally gluten-free BUT they are prone to cross contamination in the growing process which is of concern for people who are gluten-free for medical reasons such as celiac disease. The safest gluten-free oats are grown via a process known as purity protocol to eliminate cross contamination. 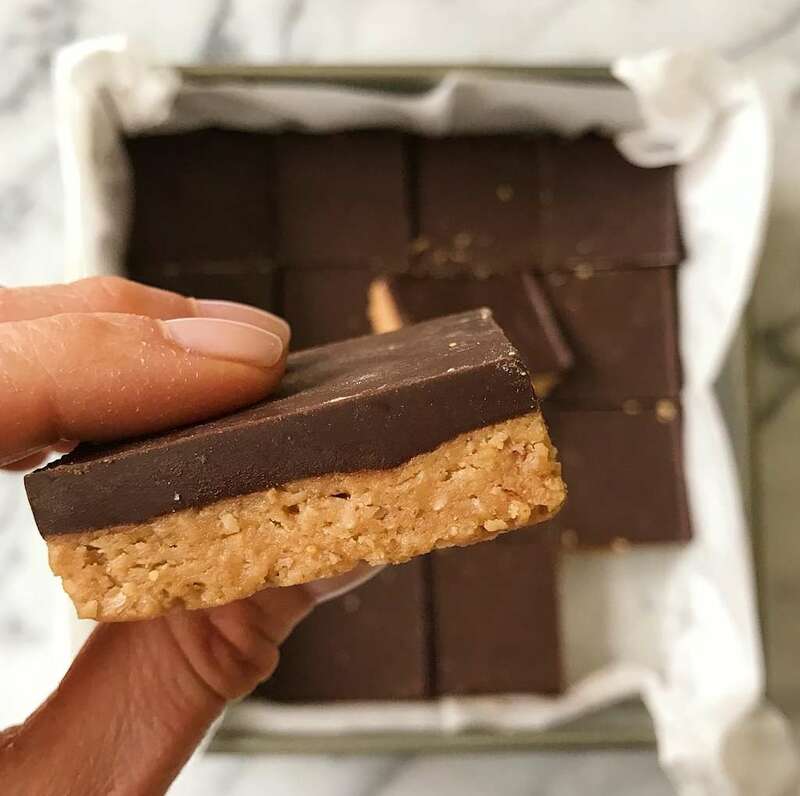 As the demand for gluten-free products has grown, many manufacturers use gluten-free oats that are sorted and there are questions surrounding this practice. 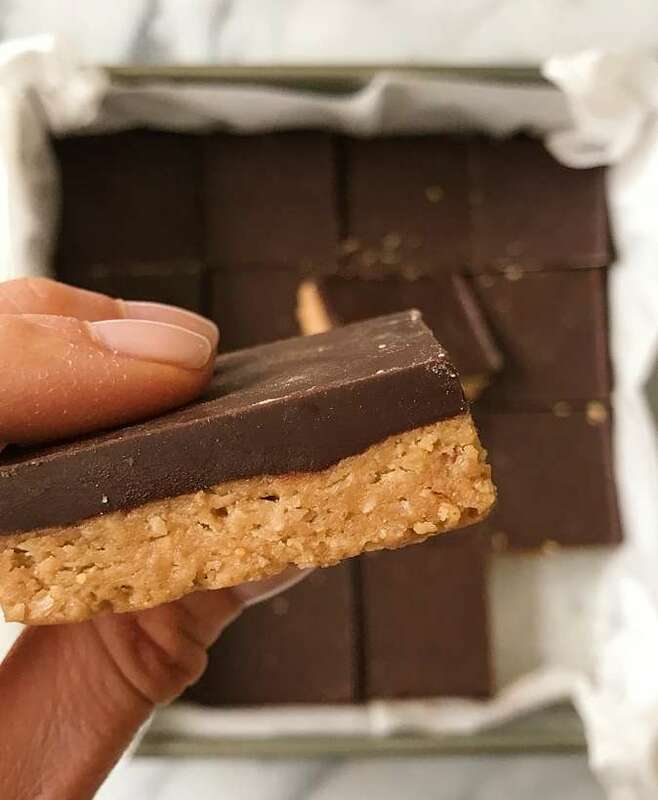 Gluten-Free Watchdog has done lots of research and writing about this topic to which I’ve linked to if you want to read more. I’m also linking to a post by GF Jules about this topic and to the Gluten-Free Watchdog list of Oats grown under Purity Protocol. A super easy pancake recipe that gives you fluffy, hearty and delicious pancakes every time! Recipe adapted from Genius Kitchen, we made them with Gluten-free Oats and GF Jules Gluten-free flour. Batter saves well for the next day. Add and beat in eggs, followed by oil, then add and mix in the remaining ingredients. Note: Original recipe says batter will be thin but we actually found batter to be average to thick each time we've made these. 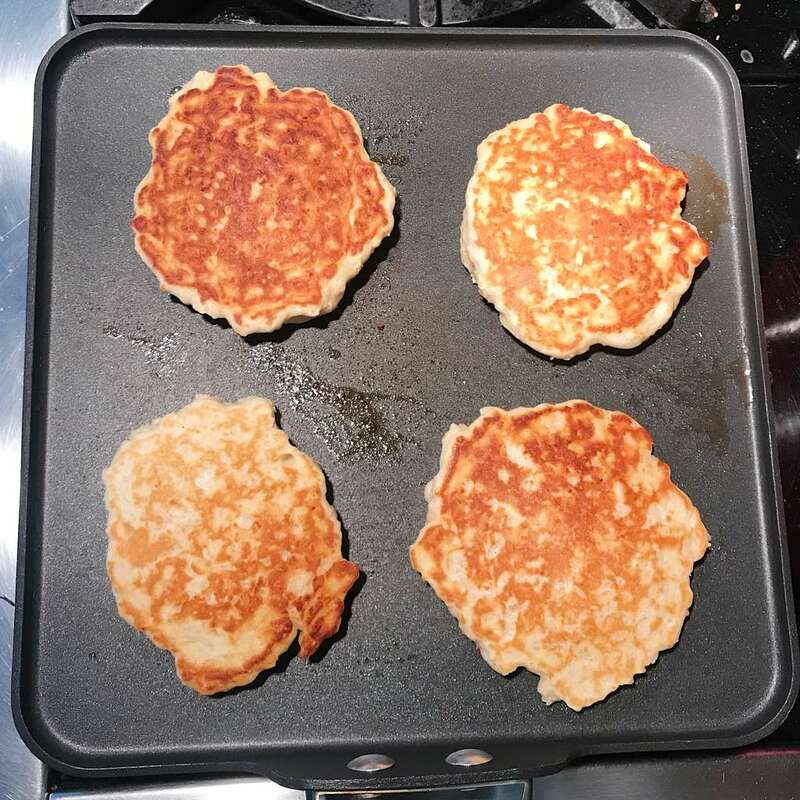 NEW NOTE: I've found that the pancakes are fluffier and cook better when the batter is thicker, so if batter seems thin, let is sit and settle 5 minutes before next step. Heat a large fry pan or griddle, melt a small amount of butter or spray with cooking spray, and scoop mixture onto pan. Use the backside of the spoon to gently even out batter and form shape. Cook both sides 3-5 minutes or until lightly browned on both sides. Do these pancakes freeze well? Thoughts on subbing buttermilk for regular milk? Hi. I don’t believe it would work. Coconut flour is much more absorbent than an all purpose flour so you’d need significantly less of it and/or might need an additional egg, but having never tried it, I can’t give exact measurements. These were delicious! My kids were very pleased! A nice alternative to the box mix! Great! So happy you all loved the pancakes! I am so addicted to these panckaes! They are absolutely delicious! I just made a batch of batter this morning. I had my panckaes with raspberries and blueberries – so good!. 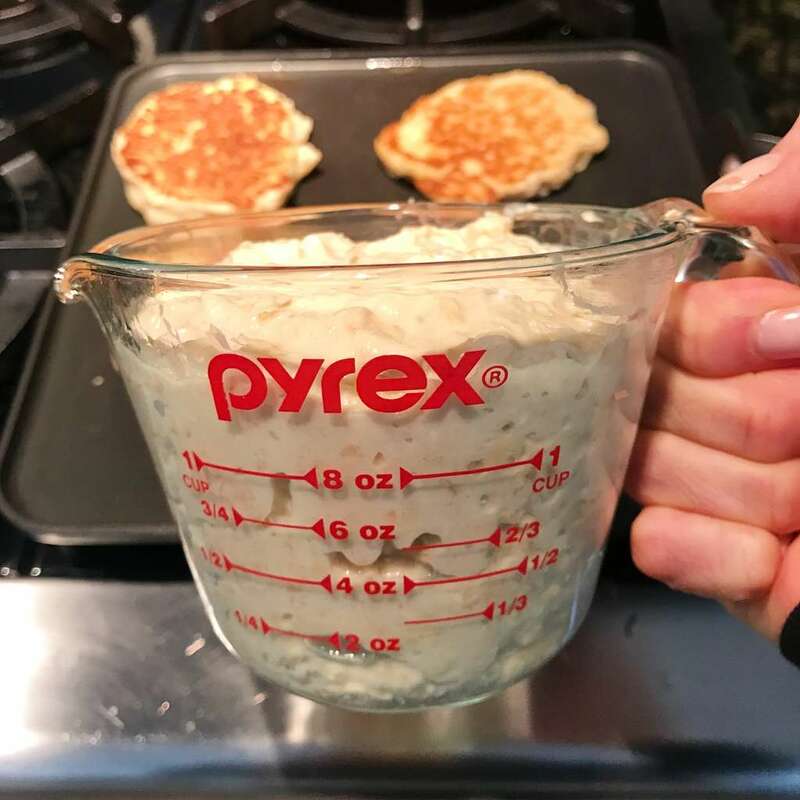 I keep the leftover batter in the refrigerator to make for a quick breakfast during the week. So happy you love them as much as we do! And I love that you added raspberries and blueberries! My kids and I loved this pancake recipe! 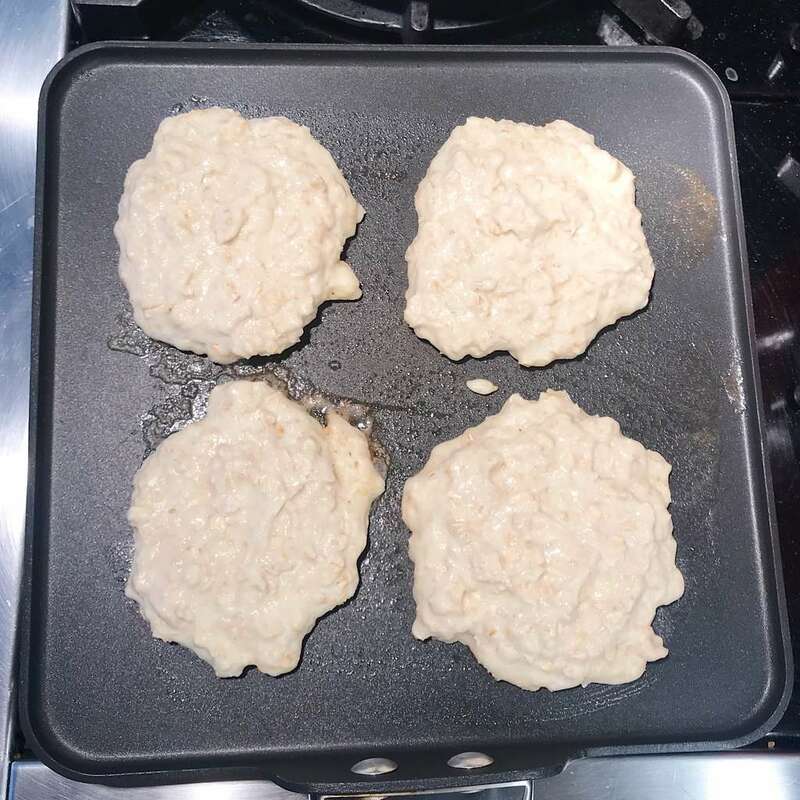 I have Celiac Disease (diagnosed 8 years ago) and my family and I often use pancake mixes because we haven’t quite mastered gluten free baking (and pancake-making). 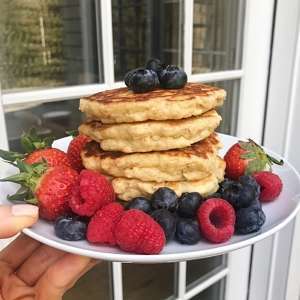 I added a bit of cinnamon and brown sugar to the batter and the pancakes tasted like a bowl of oatmeal made into a fluffy pancake! 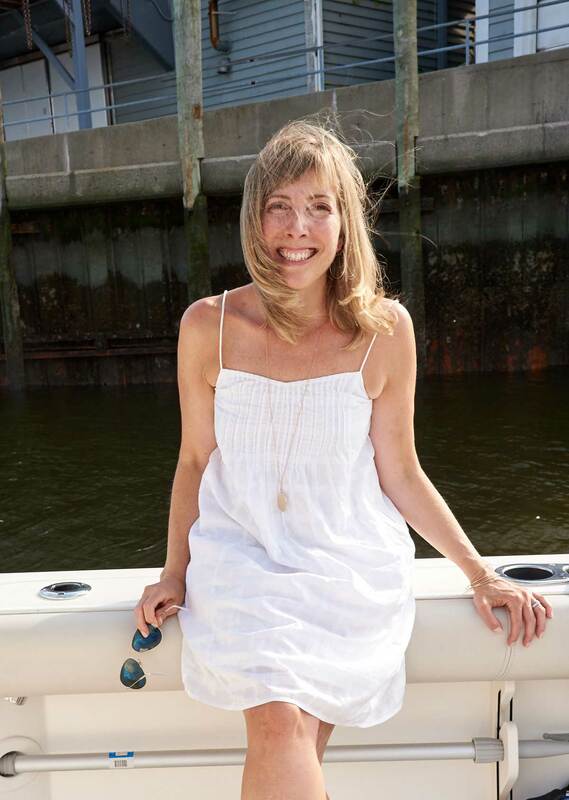 Thank you again, Karen! You’re welcome! So happy you loved it as much as we do! And Cinnamon is a great add always!